Aim: Absent pulmonary valve syndrome (APVS) is found in 3-6% of patients with Tetralogy of Fallot (TOF). Along with findings of TOF, absence of pulmonary valve tissue results in aneurysmal dilatation of the main and branch pulmonary arteries compressing the trachea, main-stem, and intrapulmonary bronchi leading to obstructive airways disease. Our objective was to review pulmonary function tests (PFT) in TOF-APVS patients. Materials and Methods: Eight PFT were performed on five mechanically ventilated TOF-APVS patients in the intensive care unit. Tidal volume, forced vital capacity (FVC), maximal expiratory flow 25%, resistance and compliance of the respiratory system were measured. Results: Pre-operative PFTs showed markedly elevated airways resistance (R RS ) (median 0.45 cmH 2 O/mL/sec, range 0.17-0.66) and marked variability of the static compliance of the respiratory system (C RS ) (median 0.6 mL/cmH 2 O/kg, range 0.25-2.6). 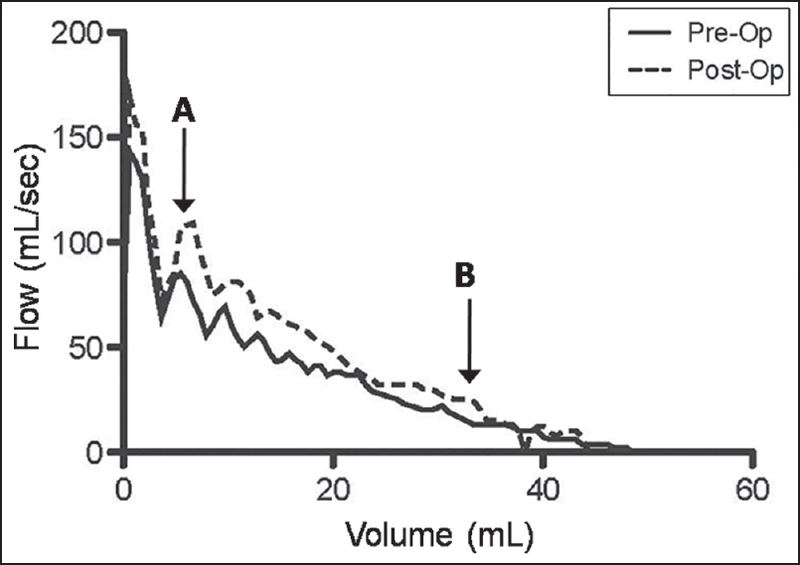 Flow-volume loops measured by forced deflation showed flow limitation within the medium to small airways. Post-operative FVC was reduced in four of the five patients (median 46 mL/kg, IQR 42.9 - 48.8 mL/kg). Patients studied with various levels of positive end expiratory pressure (PEEP) showed improvement in tidal volume and reduced obstruction with PEEP greater than 10 cmH 2 O. For three patients with pre-operative data available, surgical correction resulted in near-normal post-operative C RS and improved, but still elevated R RS (median 0.14 cmH 2 O/mL/sec, interquartile range [IQR] 0.11-0.31). Conclusion: For our patients with TOF-APVS, airway resistance was elevated. Flow limitation was seen in the medium to small airways with a mild reduction of FVC. 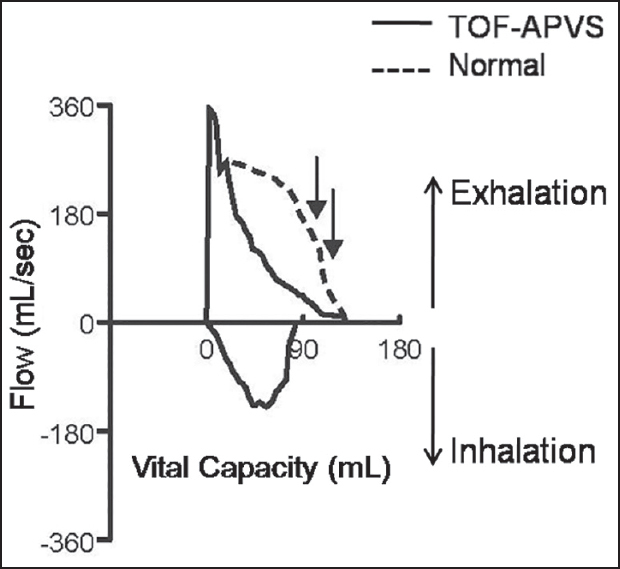 PFTs may help guide management of mechanical ventilation for TOF-APVS patients. Absent pulmonary valve syndrome (APVS) is a rare malformation that can occur in 3-6% of patients with Tetralogy of Fallot (TOF). The condition is characterized by all the classic findings of TOF (pulmonary stenosis, overriding aorta, anterior malaligned ventricular septal defect [VSD], and right ventricular hypertrophy) along with rudimentary or absent pulmonary valve tissue. Absence of the pulmonary valve causes pulmonary regurgitation and aneurysmal dilatation of the main and branch pulmonary arteries (with right pulmonary artery more frequently dilated than left) that can compress the trachea and main stem bronchi. Vascular compression may even occur among the intrapulmonary bronchi due to abnormal pulmonary artery branching during fetal life predisposing patients to develop varying degrees of more distal obstructive airway disease. , The extent of the obstructive airway disease contributes to the patient's morbidity and mortality before and after surgery. TOF-APVS patients can be clinically differentiated into two groups; those who present with respiratory symptoms prior to surgery and those who do not. The groups are equally divided and likely represent the severity of the disease process for that individual patient. For TOF-APVS patients who present prior to surgery their respiratory symptoms tend to occur in the first 3 months of life. In contrast, patients without respiratory symptoms follow a course similar to patients with classic TOF. Given the variability in the clinical degree of obstructive airway disease among children with TOF-APVS, objective quantification of the degree of airway obstruction before and after surgery may be helpful for their clinical management and prognosis. To date, there have been no published reports to quantify the degree of airway obstruction in patients with TOF-APVS. The purpose of this study is to present our experience with five patients with TOF-APVS and demonstrate the utility of performing pulmonary function tests (PFT) during the peri-operative period for these patients. This is a single-institution, retrospective study describing the clinical outcomes of five patients with TOF-APVS who had pulmonary function tests (PFT). We reviewed each patient's medical record to determine the hospital course including birth history, clinical presentation, surgical procedure, post-operative course, duration of mechanical ventilation, duration of intensive care unit (ICU) stay, and outcome. PFTs were performed as part of routine clinical care while these patients were intubated and mechanically ventilated. The patients were receiving ongoing sedation titrated to need based upon nursing and physician assessments. PFTs were performed in a standardized manner using the SensorMedics ® 2600 Infant PFT Cart (CareFusion, Yorba Linda, CA) and calibrated pneumotachometers (PNT). 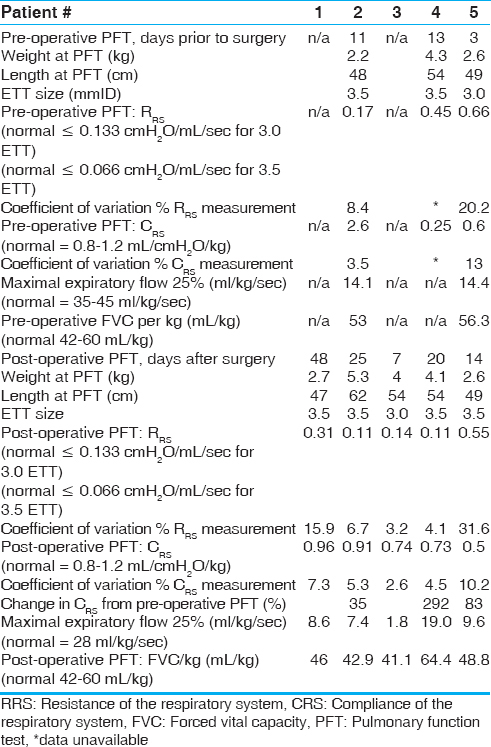 All five patients had PFTs measured post-operatively, and three had pre-operative values available for comparison. Raised volume-negative pressure forced deflations included measurement of forced vital capacity (FVC) and maximal expiratory flow 25% (MEF25). MEF25 is the forced flow when 25% of the forced vital capacity remains in the lungs. MEF25 (European convention) is therefore equivalent to Forced Expiratory Flow 75% (US convention). The ERS/ATS standard for raised volume forced expiration in infants primarily addresses techniques for non-intubated patients using rapid thoracic compression by means of a jacket surrounding the child with an inflatable bladder. Our measurements of FVC were performed in a different manner by means of a negative pressure forced deflation. This method has been previously described. The patients were manually ventilated with a self-inflating or flow-inflating anesthesia bag connected to wall oxygen and a pressure manometer. The endotracheal tube and anesthesia bag are connected to the side ports of a three-way directional sliding valve (8540 series, Hans Rudolph, Shawnee, KS). The third port is connected to a PNT inline to a 100 Liter reservoir maintained at a constant pressure of −40 cmH 2 O. During a measurement, the airway pressure is brought up to + 40 cmH 2 O for 3 seconds and the sliding valve is activated. The endotracheal tube is now connected through the PNT to the −40 cmH 2 O reservoir. The resulting exhalation is measured by a PNT with a 0 to 100 L/min flow range (4719 series, Hans Rudolph, Shawnee, KS). Exhalation was maintained until expiratory flow ceased or for 3 seconds at which time the slider valve returned to its original position and the manual ventilation resumed. Summary details of the patient demographics are in [Table 1]. All patients presented in the newborn period and cyanosis or respiratory failure was the indication for the echocardiogram that led to the diagnosis. Two patients were unable to leave the hospital prior to their surgical correction. Four patients required bronchoscopy for clinical purposes following surgery and showed some degree of bronchomalacia. Four of the five patients survived and were eventually discharged home or transferred to a community hospital after surgery. 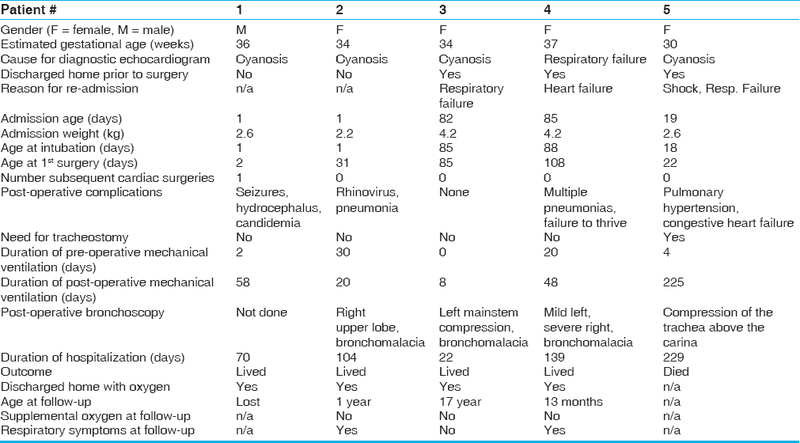 These four survivors needed total mechanical ventilation ranging from 8 to 68 days (post-operative duration of mechanical ventilation was 8 to 58 days) and their hospitalization duration ranged from 22 to 139 days. In addition to closure of the ventricular septal defects (VSD), surgical correction of all patients included use of a pulmonary homograft. For patient 1, the pulmonary homograft was placed during the second surgery with revision of a leaking VSD patch. Reduction pulmonary arterioplasty was performed in patients 2 and 3. Anterior translocation of the pulmonary arteries was performed in patients 2 and 4. Details of their PFTs are in [Table 2]. Three patients had pre-operative PFTs and all had elevation of their airways resistance (R RS ). For two patients the PFTs results led to the use of increased positive end expiratory pressure (PEEP) for lung recruitment and to overcome intrinsic PEEP. Results of the PEEP titration curve are shown in [Table 3]. [Figure 1] shows the results of a forced vital capacity maneuver for one patient with an idealized normal curve superimposed on it. [Figure 2] shows a passive deflation flow-volume curves for patient 5. These curves were measured during the exhalation phase of a mechanical ventilator delivered tidal volume breath during a single breath occlusion measurement. Comparison of the flow-volume curves before and after surgical correction of TOF-APVS show increased airflow within the larger airways post-operatively but no changes in airflow within the small airways. The one patient who died in our cohort had the most severe degree of obstructive lung disease (Patient # 5, pre-operative R RS 0.66 cmH 2 O/mL/sec, post-operative R RS 0.55 cmH 2 O/mL/sec) and was mechanically ventilated the longest (for 229 days until the patient's death). In our experience, fixed airway obstructions with such high R RS values are usually incompatible with life. It has to be emphasized that passive mechanics data includes the physical characteristics of the endotracheal tube affecting C RS to a minor and R RS to a much greater extent. Normal R RS in intubated infants have been previously reported by von Ungern-Sternberg et al. according to endotracheal tube (ETT) size and were 0.133 (SD 0.034cmH 2 O/mL/sec for ETT size of 3.0 mm and 0.066 (standard deviation [SD] 0.017) cmH 2 O/mL/sec for ETT of 3.5 mm. The equipment used in our measurements was identical to those of von Ungern-Sternberg et al. We measured a decrease in R RS after surgical correction which is however not reflected in the measurements of forced expiration. Forced deflation may fail to detect improvements in peripheral airway obstruction when bronchomalacia is present and airway collapse occurs during forced expiration. Surgical correction may relieve some of the airway obstruction caused by extrinsic compression but not improve the airway stability in patients with TOF-APVS. However, due to our small sample size, the clinical significance of this improvement in our patients with severe obstructive airway disease remains unclear. For our patients with TOF-APVS, the information we obtained from PFTs were useful in the patient's post-operative ventilatory care. Adjustment of PEEP during pulmonary function testing showed improvement in the tidal volume and R RS with PEEP greater than 10 cmH 2 O with clinical decrease in the work of breathing (WOB). This demonstrates the beneficial effect of PEEP stenting or stabilizing collapsible airways in patients with TOF-APVS. Interval measurements of PFTs were also helpful for the clinician especially during discussions with the family regarding the patient's clinical status and respiratory prognosis. As expected from pathophysiology, inhaled albuterol did not improve R RS in the one patient where it was tested (data not shown). From our experience, we would recommend performing PFTs in TOF-APVS patients that require respiratory support both before and after surgery. One would hope to identify a reduction in R RS with surgery approaching normal values. If there is no significant improvement that information would be valuable for prognosis. Should the patient have difficulty weaning from mechanical ventilation, we would suggest repeating PFTs during manipulation of PEEP. The limitations of this study include the retrospective nature of the analysis involving a small cohort of severely ill patients with a rare variant of a cardiac disease. Due to the rarity of the absent pulmonary valve syndrome variant of TOF, it is difficult to make conclusions from the results of a small cohort of patients. Further, it is difficult to make conclusions for the less ill patients with TOF-APVS. To date, this is the only report quantifying the degree of obstructive lung disease using PFTs in TOF-APVS patients. Data from a larger cohort will be needed for a more robust analysis. Potentially, pulmonary function testing may play a role in adjusting the ventilator setting, and assessing the benefit of surgical correction and the evolution of airway obstruction during mechanical ventilation. Rao BN, Anderson RC, Edwards JE. Anatomic variations in the tetralogy of Fallot. Am Heart J 1971;81:361-71. Bove EL, Shaher RM, Alley R, McKneally M. Tetralogy of Fallot with absent pulmonary valve and aneurysm of the pulmonary artery: Report of two cases presenting as obstructive lung disease. J Pediatr 1972;81:339-43. Rabinovitch M, Grady S, David I, Van Praagh R, Sauer U, Buhlmeyer K, et al. Compression of intrapulmonary bronchi by abnormally branching pulmonary arteries associated with absent pulmonary valves. Am J Cardiol 1982;50:804-13. Chang AC, Hanley FL, Wernovsky G, Wessel DL. Pediatric Cardiac Intensive Care. Philadelphia: Lippincott, Williams, Wilkins; 1 st edition, Vol 1, 1998. p. 357. Fischer DR, Neches WH, Beerman LB, Fricker FJ, Siewers RD, Lenox CC, et al. Tetralogy of Fallot with absent pulmonic valve: Analysis of 17 patients. Am J Cardiol 1984;53:1433-7. Gappa M, Colin AA, Goetz I, Stocks J. ERS/ATS Task Force on Standards for Infant Respiratory Function Testing. European Respiratory Society/American Thoracic Society. Passive respiratory mechanics: The occlusion techniques. Eur Respir J 2001;17:141-8. Hammer J, Patel N, Newth CJ. Effect of forced deflation maneuvers upon measurements of respiratory mechanics in ventilated infants. Intensive Care Med 2003;29:2004-8. Hammer J, Numa A, Patel N, Newth CJ. Normal values for pulmonary function in intubated infants. Am J Respir Crit Care Med 1995;151:A439. Hammer J, Newth CJ. Infant lung function testing in the intensive care unit. Intensive Care Med 1995;21:744-52. Hammer J, Newth CJ. Effect of lung volume on forced expiratory flows during rapid thoracoabdominal compression in infants. J Appl Physiol (1985) 1995;78:1993-7.
von Ungern-Sternberg B, Trachsel D, Erb TO, Hammer J. Force vital capacity (FVC): Normative data obtained in anaesthetised infants and children. Eur Respi J 2005;22:69-70.
von Ungern-Sternberg BS, Trachsel D, Erb TO, Hammer J. Forced expiratory flows and volumes in intubated and paralyzed infants and children: Normative data up to 5 years of age. J Appl Physiol (1985) 2009;107:105-11. Dunnigan A, Oldham HN, Benson DW Jr. Absent pulmonary valve syndrome in infancy: Surgery reconsidered. Am J Cardiol 1981;48:117-22. Hraska V, Kantorova A, Kunovsky P, Haviar D. Intermediate results with correction of tetralogy of Fallot with absent pulmonary valve using a new approach. Eur J Cardiothorac Surg 2002;21:711-4. Hammer J, Numa A, Newth CJ. Albuterol responsiveness in infants with respiratory failure caused by respiratory syncytial virus infection. J Pediatr 1995;127:485-90.